After the last article on foundation of taijutsu I redesigned the budomart website accordingly. 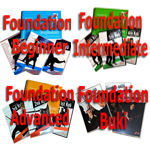 Please visit it and discover the new foundation series. 4 sets covering 612 techniques, 26 dvds, more than 22 hours of videos.